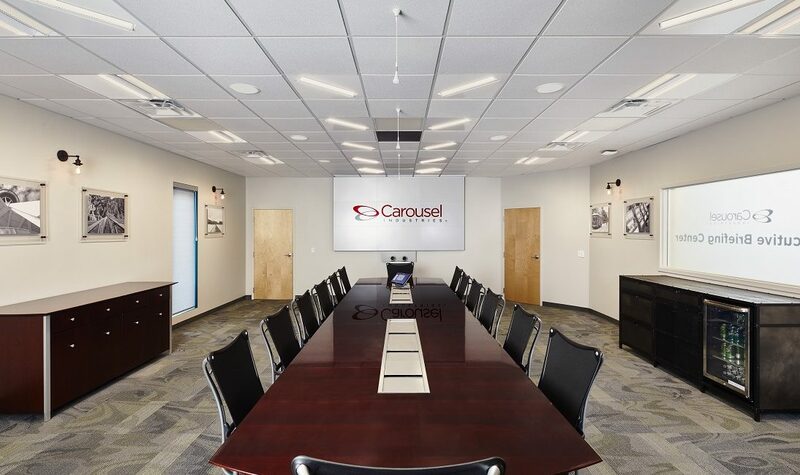 Carousel Industries understands that lighting has an incredible impact on PoE video conferencing. Ask their supplier, Brightline. 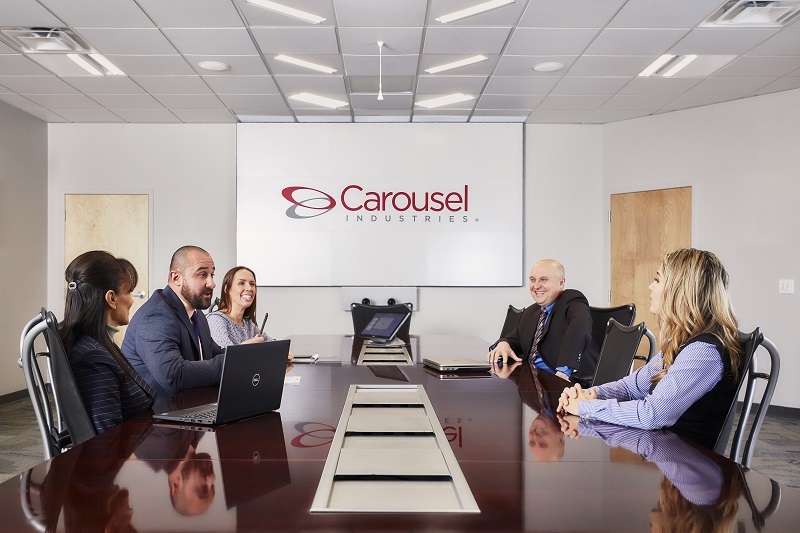 That’s Brian Fichter, Director of Portfolio Strategy, Video Collaboration at Carousel Industries, talking about Brightline’s new Power over Ethernet PoE video conferencing lights. Like other Brightline products, the new Flex-T LED ceiling fixtures are optimized for video and fit into a standard 2’ x 2’ ceiling grid. But these super low-voltage fixtures do not require installation by a licensed electrician, nor do they need conduit-encased wiring. Power and control are carried on far less expensive Cat5 or Cat6 network cable. “Great lighting makes a great deal of difference in any video conference, but up to now our clients have been reluctant to make the investment,” Fichter explains. But now the costs and the hassle have dropped to the point that he believes lighting will become a standard part of Carousel’s offerings. For more than 25 years, Carousel Industries has offered IT integration services to corporate, government and university customers, focusing on infrastructure, security, collaboration, cloud and managed services. 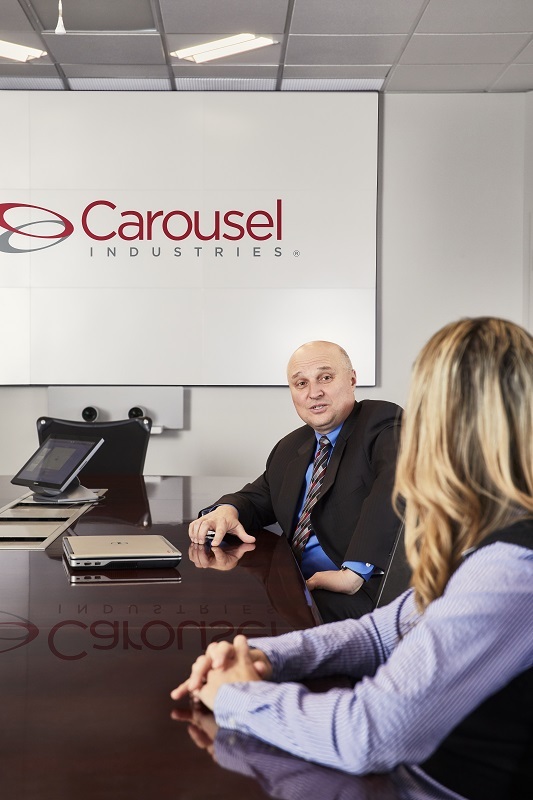 Fichter joined Carousel Industries in 2013 with the goal of building the company’s fledgling AV business into a significant revenue producer. “A lot of AV integrators have focused on the bigger, more complex boardrooms and telepresence rooms, which are really only the tip of the iceberg,” he explains. That, he says, has played into Carousel’s core expertise as IT integrators and helped him grow the AV side of the business from about $11 million to more than $70 million in revenue in just six years. This year, Fichter and his team upgraded the Executive Briefing Centers in the company’s two largest offices, in Exeter, Rhode Island and Windsor, Connecticut. Both rooms now use Cisco SX80 codecs, Cisco speaker track cameras, ClearOne DSPs plus Crestron DigitalMedia and control. “The systems vary a little, with Exeter using a 3 x 3 Planar video wall and Windsor two 80” wall-mounted displays, yet the quality of the video coming from Exeter is dramatically better than Windsor,” Fichter explains. The angle, color and brightness of the Brightline system all contribute to the improved video. First, while the Brightline Flex-T fixtures fit into a standard 2’ x 2’ ceiling grid, they do not point straight down like traditional fixtures. Instead, they can be set up at an optimal angle (usually about 45°) to provide soft, pleasing light and avoid the harsh shadows under participants’ eyes, noses and chins that are typical of overhead lighting. Because the lights are angled to the axis of the room as well as the ceiling, the video wall is shielded from glare, as would be projection screens or other types of large-screen display in other rooms. In the Exeter room, the Carousel Industries team positioned 12 of these fixtures, above and somewhat to the front of each position at the conference room table. When a conference begins and participants turn their chairs toward the front of the room, the angle of the fixtures is optimal for video, much like a large soft light would be in a photo or video studio. Nine additional down-facing fixtures, arranged around the perimeter of the room, provide matching wash lighting for the sides and back of the room, giving a pleasing effect for a video’s background. Second, the Brightline fixtures produce a clean, pleasing, natural white light, with a color rendering index of 90 or higher. At Exeter, Carousel is running the fixtures at 3500° K, but they can also be set at 3000°, 3500° or 4000° K.
Third, the brightness of the fixtures helps the Cisco cameras perform at their optimal quality. It’s important to note that the lumen output of the PoE fixtures is identical to that of Brightline’s AC-power lights. “What makes these rooms look so good is where we don’t put light,” says Brightline partner Sam Cercone. Brightline has been building PoE video conferencing and studio lighting for more than 20 years – but Fichter says that, up until now, the Carousel Industries team has only occasionally been able to sell them into customer rooms. That’s partly because of what had been a premium cost, but also because of the time and complexity of bringing in a separate electrical contractor. Now all they have to do is run new plenum-rated Ethernet cable. To provide both power and control, the Carousel installers, or the client’s own IT staff, are simply extending the enterprise network to a few more nodes, in this case to 21 new Brightline fixtures. Fichter estimates the cost of the Exeter lighting project was about 50 – 60% less using the Brightline fixtures than it would have been with standard electrical fixtures. “And because each fixture is a node on the network, we can manage them remotely as we would with any network device, either through the IT office or via Carousel’s managed services division,” he adds. That ability, he believes, will be very attractive to client IT managers, as it is to Carousel’s own IT staff. Now that the Exeter lighting system is working and in use, Fichter says he will begin upgrading Carousel Industries Executive Briefing Center in Windsor. Still, the main value, Fichter says, is in his AV group’s offerings.